Despite the controversy in Arizona these days, there is no doubt that the state has a rich history in culture, immigration and language. According to 2000 U.S. census data, 25.9 percent of the population speaks a language other than English; primarily Spanish, Navajo, and other Native American languages, but also German, Chinese, French, Tagalog, Vietnamese, Italian and Korean. Many of these these speakers are equally bilingual in English and another language, serving as translators and interpreters for businesses in the state and organizations around the country. Boycotting services from Arizona could potentially hurt the translation and interpretation industry in the state, and the businesses who use them. According to the Arizona Department of Commerce, there were 1,293 active translators and language interpreters in Arizona in 2006. These figures are only expected to climb, with 1,573 by 2016, as demand for language needs in government, education, and business increases. More than 80 translators in Arizona are recognized by the American Translators Association (ATA). Translators and interpreters recognized by the ATA are often preferred by businesses, multi-national corporations, and NGOs in the U.S. and around the world. To meet the education demands of the translation sector, universities have increased their language instruction offering. Arizona State University now offers degrees in Chinese, Japanese, French, German, Italian, Russian, and Spanish. But some universities abroad have cancelled their exchange programs with Arizona state schools due to the controversial immigration law. Cultural exchange is integral to any language-related program. Phoenix Mayor Phil Gordon (D), who opposes the Arizona immigration law, has called for an end to the boycotts and has blamed the media for the divisive battle. "Unfortunately, it's added another dimension to splitting the community over this debate," Gordon addressed the media earlier last month. The city of Los Angeles and many smaller cities and groups have begun to stop doing business with the state while many others are threatening to start doing so. "We were just starting to see recovery...I just plead with everybody not to be boycotting Arizona and Phoenix. It hurts everybody". Perhaps the boycotting of Arizona may send a message to politicians, but is not in the best interests of the translation industry in Arizona and the businesses around the country who need such services. From Flemish to Finnish, Learn Essential Phrases in 36 Languages! You may be traveling abroad this summer, and if you're like the most of us, you have very little time to learn a whole new language. Before my trip to Amsterdam last March, I sought the "Dutch Essentials" iPhone app to learn a few words of Dutch. The only word I can still remember is Proost (Cheers! ), but it was still nice to have some extra words in my pocket in case I needed them. Perhaps our native Dutch translator could teach me a bit more. Raudel is a translation project coordinator for French and Spanish at Precision Language & Graphics. Pictured: Smiling children at Cobá, Quintana Roo, Mexico . Google Mexico has recently announced that it will include Mayan and Nahuatl, two of Mexico’s most widely spoken native languages, to its “Google Traductor” (Google Translate) services. Nahuatl, part of the Uto-Aztecan language family, is spoken by 1.5 Nahua people, mostly from Central Mexico, El Salvador, and immigrants in the United States and Canada. 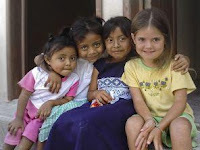 Mayan languages, though diverse, are spoken by 6 million indigenous Maya in the region. Up to 1.2 million speak the Yucatecan dialect in Mexico’s Yucatan peninsula alone. While many natives speak Spanish and some are assimilated into mainstream Mexican society, there continues to be a major social and economic gap, especially for those who live in the remote Mexican jungle. Adding these languages to the Google Translate feature may be a recognition of populations who speak them and a small step in bridging the gap. In the past, the internet has often been used as a tool for promoting indigenous people’s rights around the world. The most notable example is the peaceful Zapatista uprising where indigenous groups from the state of Chiapas protested against the Mexican government, particularly calling for agrarian reform. The group went online to urge the international community to support their struggle against inequality in Mexico. The world heard, yet inequality is still a major problem for indigenous peoples of Mexico. However, the internet continues to be a valuable tool in many ways. Central America is susceptible to many natural disasters such as mudslides and hurricanes, and emergency responders need to act quickly and communicate with the native-speaking populations. While machine translation does not effectively replace a human translator, it may be the only option during an emergency situation when one is not promptly available. Google Translate had added Haitian Creole earlier this year in the hopes to help earthquake emergency responders communicate with the Haitian Creole speakers. Microsoft’s Bing Translator had also added Haitian Creole to its list of languages offered. Easy access to Nahuatl and Mayan translations may be critical in similar situations.